Safco Muv Stand-up Adjustable Height Desk - Stand-up workstation adjusts in height from 35 to 49". Designed for stand-up computer work. Keyboard tray extends 9-3/4" and retracts under the worksurface when not in use. Keyboard tray holds up to 25 lb. The desktop holds up to 100 lb. 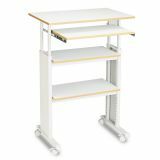 Design includes a heavy-duty steel frame with powder-coat finish, 3/4" compressed wood shelves, and snap-on cable management side covers. Worksurface measures 29-1/2" wide x 19-3/4" deep, and keyboard shelf is 22-3/4" wide x 13-1/2" deep. 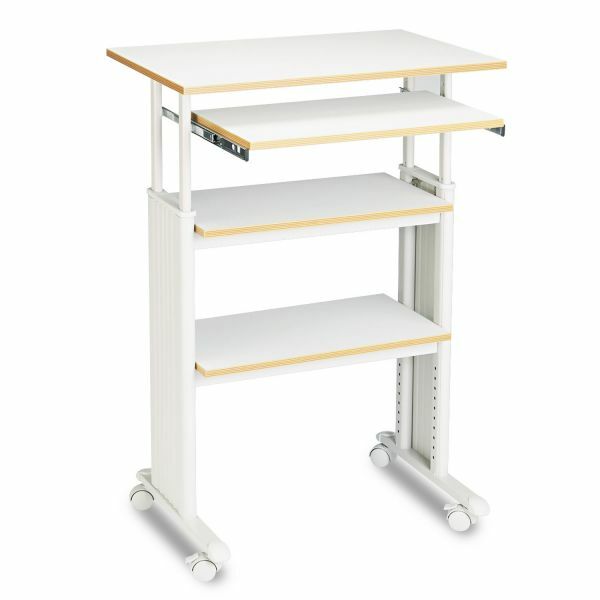 Roll stand-up workstation easily on four casters (two locking).